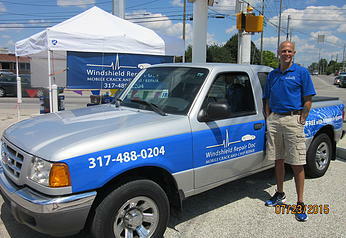 Mobile Windshield Repair Service in Indianapolis! We know your schedule can be tight. That’s why we offer our convenient Mobile Chip Windshield Repair Service. We will come to your house, place of business, kid’s baseball game…or where ever you need us to be. We’ll do the windshield chip repair while you go about your busy day. It’s quick, convenient and professional. Most crack and chip windshield repair work can be done in about 20-30 minutes. All windshield repairs are warrantied for life. See also ‘How much does Windshield Repair Cost?